The art of contortion is a path taken by many young girls in Mongolia, offering a global lifestyle and an income to help support their families back home. A tough and disciplined life, training rigorously every day from an early age to achieve extreme flexibility and balance, contortionists perform solo, duo or in group acts. I have been very fortunate to have a close up view of the incredible world of contortion artists through my talented sister-in-law. Anna started training as a contortionist when she was seven years old. She traveled around the world with the Mongolian State Circus then worked for Cirque du Soleil’s Las Vegas productions “O” and “Zumanity”. In the latter show, she was part of a “Water Bowl Contortion” act performing inside a water-filled giant glass bowl and on its rim. 1. Anna hanging out in Trafalgar Square, London. Anna met my brother Mike in Cirque du Soleil’s “O” show where he was performing as a fire artist. Since becoming freelancers they’ve both toiled to create a nine-girl contortion team called “The Blue Sky Girls“, named after the revered Mongolian deity Khokh Tenger translating to ¨Blue Sky¨. Sourcing the best young talent from Mongolia, together they coach, create fresh, original acts and negotiate international contracts for the girls to perform worldwide. In 2010, the team won the coveted Bronze Clown trophy (there are Gold, Silver and Bronze “Clowns”) and a special prize, the Prix Du Kobsov Circus, at the annual International Monte-Carlo Circus Festival (Festival International du Cirque de Monte-Carlo) in Monaco. The Academy Awards of the circus world and the most prestigious circus festival on the planet, it’s one of the glitziest events in Europe, attended by international celebrities and royalty. A Monte-Carlo “Clown” is the dream prize among circus performers and to them is like winning an Oscar! The team also won a bronze cup and special prize at the 2010 Wuhan International Acrobatic Art Festival of China then landed a winter contract in the captivating “Salto Natale” show in Switzerland. 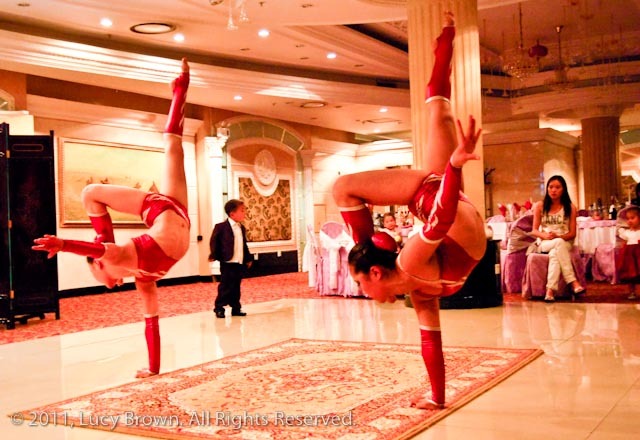 Two of the contortion artists from “The Blue Sky Girls“, Gerlee and Tsetse, performed at Anna and Mike’s wedding reception in Mongolia’s capital city Ulaanbaatar. Following are some of those moments captured. Check out Anna’s performance photos and videos on her website. This entry was posted on April 2, 2011 by loca4motion. 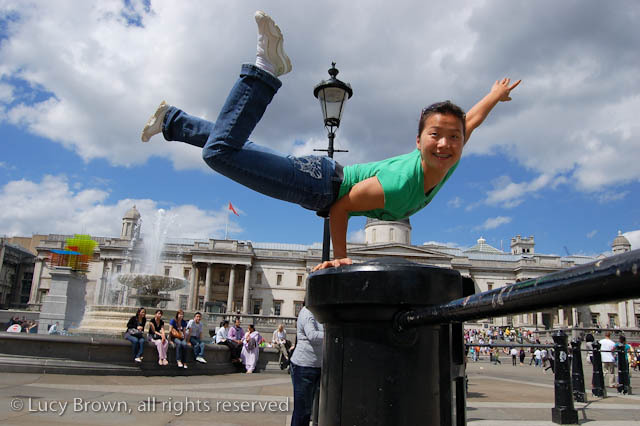 It was filed under Asia, Mongolia and was tagged with blue sky girls, contortion, contortionist, festival international du cirque de monte-carlo, international monte-carlo circus festival, mongolia, mongolian, photography, traditions, travel. Wow! What an incredible sport! They bend themselves right in half. wow. Im speechless. Super kudos to your sister-in-law. Great post. They’re unbelievably flexible. Anna stands talking to me then suddenly touches her head with her foot as if it was her hand! Amazing! Does she still perform now? I wish I was that flexible! Yes, Anna still performs freelance. Take a look at her website if you haven’t already as she’s so talented and there are some amazing photos and videos of her. I wish I was that flexible too! Thanks for the link Eric. It’s definitely a tough life at the beginning however my sister-in-law and other contortionists I’ve met are happy with the opportunities it’s offered them to live and work overseas and send back money to their families in Mongolia. Great post! Thanks for providing insight to a very rarely seen artform. 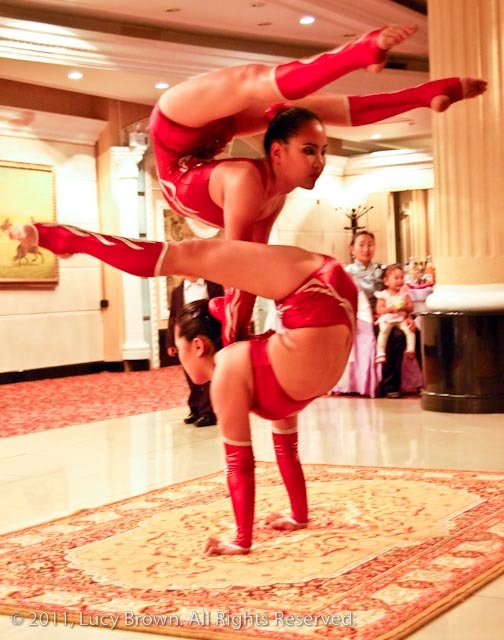 I’ve been fascinated by contortion since watching a Cirque show, and have been curious to know: given I keep reading articles about how common it is amongst girls in Mongolia to take up contortion, just how many of them make it to the big time to be able to ‘send money back to their families’? It sounds like there’s a lot of girls that go through all the pain for little reward. Thanks for your comment! Contortion IS amazing and hard work. I’ve been lucky to see a lot of it as Anna my sister-in-law is an incredibly gifted contortionist and she and my brother also scout and train young Mongolian girls for their own contortion group. I have no idea what percentage of girls make it big but like any kind of performing they have to be outstanding to really make it. Anna is trying to help as many as she can and at the moment they have two girls staying in their house while they train them and find them contracts. There seem to be quite a few Mongolian girls performing in the various shows in Las Vegas and they all know each other. My 2 year old daughter does the splits it is very freaky to see one so young do that. We just remind ourselves children’s bones are softer and more flexible. I think its great what Anna and Mike are doing. Like anything, young Girls are in danger of exploitation no matter what path in life they follow. Its an unfortunate part of growing up. Hi Debs, that’s why contortionists start so young while they’re still incredibly flexible but 2 years old is very early to be starting! I wonder if your daughter will become a gymnast or contortionist! Anna has been doing contortion all her life and has experience worldwide. However she knows her life as a contortionist is limited by age so that’s why her and Mike are now using her knowledge and their contacts to help other girls break into the international stage. Performing is their life!